Many women going through menopause experience vaginal dryness due to hormonal fluctuations. While vaginal dryness usually affects menopausal women, there are other causes for it than menopause, such as pregnancy, anxiety, or stress. Symptoms of vaginal dryness include: itching, pressure, and urination problems. There are a variety of treatments available for it, such as vitamin E and yam extract. A perennial herbaceous vine found in Oceania, Asia, Africa, and Latin America, this vegetable has a rough skin and is available in a variety of colors. They are a key commodity within Western Africa and can stay fresh for up to six months. Since the 18th century wild yams have been used to aid hormonal imbalance. It is a natural source of estrogen and is believed to lower cholesterol. However, there is insufficient scientific evidence to prove its effectiveness. Found in some foods and also available as a supplement, vitamin E is the term for a group of fat-soluble compounds that contain antioxidants. Vitamin E is available in capsule form and can either be taken orally or applied directly to the affected area, usually twice a week. It's also found in foods such as almonds, kale, spinach, and many more. Please remember, before taking vitamin E, talk to your doctor. As with wild yams, there is insufficient scientific research suggesting vitamin E is better for easing vaginal dryness than any other oil. 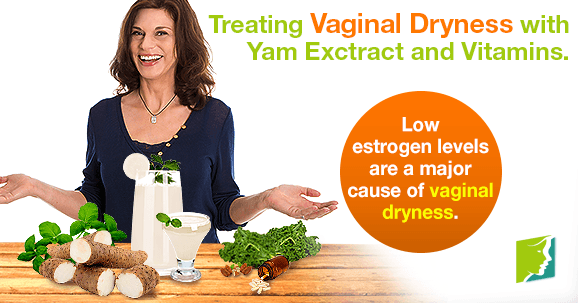 Like all menopause symptoms there are many ways for treating vaginal dryness. Wild yams and vitamin E are just two of those ways. A healthy lifestyle that includes a good diet, regular exercise, and low levels of stress and anxiety can help control hormone fluctuations and relieve vaginal dryness.